Jonah Keri discusses MLB news and goes deep on broader trends with a wide range of baseball writers, players, and executives. Jonah Keri talks to 'Parks & Recreation' and 'Brooklyn 99' co-creator Michael Schur about the World Series, the TV industry, turning 40, and the legacy of Grantland. Jonah Keri talks to Yahoo MLB columnist Jeff Passan about the World Series and some tricks of the journalism trade. Jonah Keri talks to 'New York Times' writer Tyler Kepner about the NLCS and to Grantland's Ben Lindbergh about the ALCS. Jonah Keri talks to 'The Best Team Money Can Buy' author Molly Knight about the Dodgers and to 'Star-Ledger' writer Mike Vorkunov about the Mets. Jonah Keri talks MLB playoffs with Shi Davidi, Rany Jazayerli, Evan Drellich, Travis Sawchik, Bill Shaikin, Jesse Rogers, T.R. Sullivan, Jen Langosch, Marc Carig & Jack Curry. Jonah Keri talks to Blue Jays pitcher Marcus Stroman about his rapid rehab and a magical season in Toronto. Then HardballTalk writer Aaron Gleeman covers the surprising Twins. Jonah Keri talks to Cubs play-by-play man Len Kasper about the excitement surrounding this year's playoff-bound team. Then, for 'My Team Is a Joke,' Rhea Butcher rants about the Indians and the Braves. Jonah Keri talks to 'Houston Chronicle' writer Evan Drellich and Jamey Newberg of 'The Newberg Report' about the great AL West battle between the Astros and Rangers. Jonah Keri talks to ESPN 'Baseball Tonight' analyst and two-time All-Star Mark Mulder about Matt Harvey, pitch counts, and the art of pitching. Jonah talks to MLB.com's Anthony DiComo about the first-place Mets and to 'New York Times' writer Tyler Kepner about A-Rod, the streaking Rangers, and the slumping Nationals. Jonah Keri talks to new 'St. Louis Post-Dispatch' columnist Benjamin Hochman about the Rockies, the Cardinals, and the state of journalism. Jonah Keri talks to 'Orange Country Register' writer Pedro Moura about the Angels, baseball in Brazil, and Yasiel Puig. Then, for "My Team Is a Joke," Sal Iacono talks Mets, bets, and the League of Leagues. Jonah Keri talks to ESPN.com writer David Schoenfield about the underachieving Mariners, Indians, and Marlins, and what makes a winning baseball team. 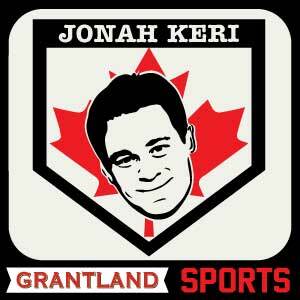 Jonah Keri talks to 'St. Louis Post-Dispatch' writer Derrick Goold about the Cardinals. Then, for 'My Team Is a Joke,' Mike Polk Jr. rants about the Indians. Philadelphia Daily News columnist David Murphy on the struggling and confusing Phillies. Then, The Crab Feast podcast host Ryan Sickler rants about the the Orioles. Jonah Keri talks to 'Arizona Republic' writer Nick Piecoro about the Diamondbacks. Then, for 'My Team Is a Joke,' comedian Jimmy Pardo rants about the White Sox. Jonah Keri talks to MLive.com writer Chris Iott about the Tigers. Then, for 'My Team Is a Joke,' Nerdist's Matt Mira rants on the Red Sox. Jonah Keri talks to 'Washington Post' writer James Wagner about the Nationals. Then, for "My Team Is a Joke," comedian Nick Mundy rants about the Astros. Jonah Keri talks to ESPN.com's Buster Olney about the Rays, the Giants, and the get-along culture that defines several successful teams. Plus, trade deadline updates! Jonah Keri talks to TSN 1050 reporter Scott MacArthur about the surging Blue Jays. Then, for 'My Team Is a Joke,' Grantland contributor Justin Halpern rants about the Padres. Travis Sawchik discusses the Pirates and his new book, 'Big Data Baseball.' Then, for 'My Team Is a Joke,' Death Cab for Cutie's Ben Gibbard rants about the Mariners. Jonah Keri talks to Twins All-Star reliever Glen Perkins about the life of a closer. Then, for "My Team Is a Joke," comedian Sarah Colonna talks about her love of the Angels. CSN Chicago's Dan Hayes on the slumping White Sox. Plus, for "My Team Is a Joke," comedian Geoff Tate talks about the Reds and his disdain for The Cardinal Way. Jonah Keri talks to general manager Jeff Luhnow about the first-place Astros, and the new 'My Team Is a Joke' segment features comedian Adam Cayton-Holland on the Rockies. Jonah Keri talks to broadcasting legend Jon Miller and comedian Greg Proops about the past and present San Francisco Giants. Jonah Keri talks to the Boston Globe's Alex Speier about Patriots' Day and the Red Sox, and to Kansas City Star writer Andy McCullough about the red-hot, swaggering Royals. Jonah talks to MLB.com's Britt Ghiroli about the dangerous Baltimore Orioles, and to San Francisco Chronicle writer Susan Slusser about the dramatically rebuilt Oakland A's.